Welcome to #PDRally2016 – Let’s Socialize! We want to socialize get personal with you! 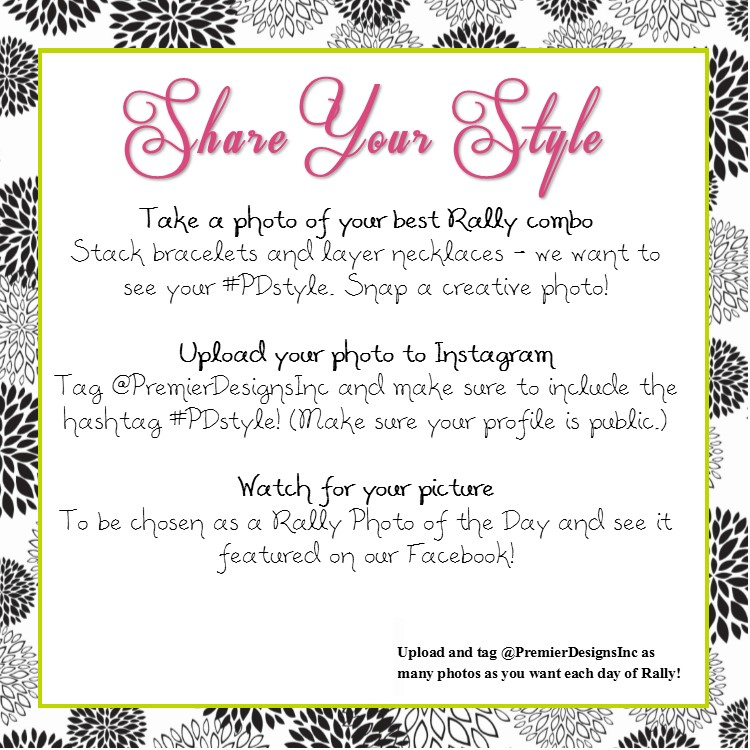 Use our #PDRally2016 hashtag on your Instagram posts to get your picture on our amazing stage screen! (Profile must be public.) And don’t forget to use it when you tweet or post on Facebook about your activity at Rally. Hashtags provide a way of grouping messages or images that can be searched. By using the hashtag, it allows us all to share Rally stories and pictures with each other. We’ll use the same hashtag for Twitter, Facebook and Instagram and can’t wait to be a part of your Rally experience too. Just so you know, make sure your profile settings are set to public so we can see your great pics too! Come see us at our booth – Social Station – in the exhibit hall next to The Outlet! Meet your Social Media Rep, Kathryn Horner, and part of her amazing Rally Team Social! Don’t forget to wear your new bling and get your #pdcombo picture for Pinterest or bring your selfie stick to take a fun pic in front of our colorful backdrop! Are you on Instagram? We are! Follow us now @premierdesignsinc to see fabulous Rally pics! From rehearsals to fireworks to backstage peeks – keep track of all Rally fun! Instagram is another way for all our Premier Family to share their style with each other! Check out the contest below and see how to get your Instagram pictures chosen as a picture of the day! Beginning Thursday, after the New Jewelry Show, we’re going to start pinning fabulous pictures of the NEW JEWELRY from the Boutique onto a secret Pinterest board! Now you won’t have to worry about missing a #pdcombo or blurry pics – we’ll do the hard work for you! Join us at *WE HEART PREMIER* and click the red “follow all” button so you’ll be able to see our secret board immediately when it’s revealed and will keep updated when new pictures are added!